There’s two things I don’t like about the way DVDs are often ripped: bootlegging and re-compression. So PLEASE, don’t distribute ripped DVD content. Private use only, OK? Keep it kosher. Recompressing…. I suppose it’s ok for portable devices, but for media serving around the home, original source quality is preferable. Quality quality quality. With a DVD, this means copying the original program material as the native MPEG-2 video stream (and also leaving the audio encoded however it happens to be encoded). A file with combined (muxed) “raw” (un-re-compressed) video and audio should be able to be played with any media player that can play and MPEG-2 file (usually extensioned .m2v). 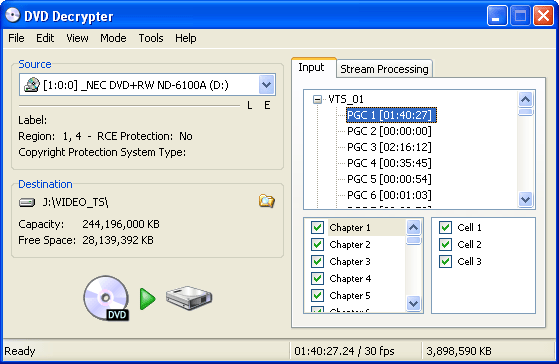 DVD Decrypter is a great tool for doing a “Direct Stream Copy” (raw copy) as it refers to it. 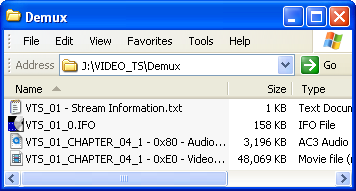 It can also demux the various streams into separate raw video and audio files. Developement of DVD Decrypter stopped after version 3.5.4.0. You can download the last made version from here. The following is a brief DVD ripping tutorial using DVD Decrypter. DVD Decrypter runs on Windows XP and I’ve heard it also works on Windows Vista (though I have not tried it). IFO refers to the DVD InFOrmation files (.ifo) that are located on a disc that store information about chapters, audio tracks, etc. IFO mode makes use of this information to make finding particular content easier. Once there, choose a file splitting option. In the IFO Mode tab there is a drop down labeled File Splitting. In many cases By Chapter is the desired setting. The By Chapter setting will allow you to select program material you wish to rip in “chapter sanctioned” chunks. With complicated program material this can be hard. A feature that can help is Edit –> Select Main Movie PGC which automatically looks for the primary content on the disc. One method of figuring out what chapters and PGCs (Program Chains) are what is to play the disc and note the runtime of the particular section (or chain) you want to rip. The following two screen shots demonstrate the selection process for ripping only Chapter 3. 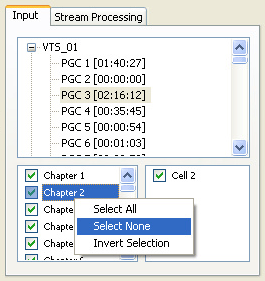 Note that you can rip multiple chapters to one continuous file by choosing the File Splitting option Auto (see step 2). From the home screen, click on the Stream Processing tab. Click the checkbox to Enable Stream Processing. If you want to have a video file that also has the audio embedded for playback, leave the radio boxes at the bottom set to Direct Stream Copy. If you want separate audio and separate video files, click on Demux. The Raw option is similar to demux as it separates streams, but raw does not remove the auxillary (structural, how streams match up info. i think.) 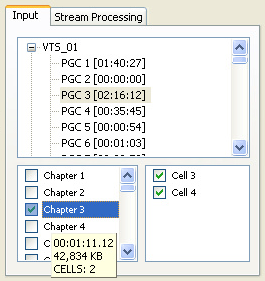 information from the particular cells that hold the streams (the demux option remove this information). NOTE: You can mix and match these options per stream. This means you could theoretically demux one stream, but not others. The Following screen shots of folders show the resulting files of a Direct Stream Copy rip and a demux rip. 4. Set destination and rip away! Click the (explore) button to set a destination for the ripped files. Press the Decrypt Button to start your rip! If you did a direct stream copy, to keep media players and Windows file associations happy, rename your ripped video/audio file which is currently named FILENAME.vob to FILENAME.m2v.